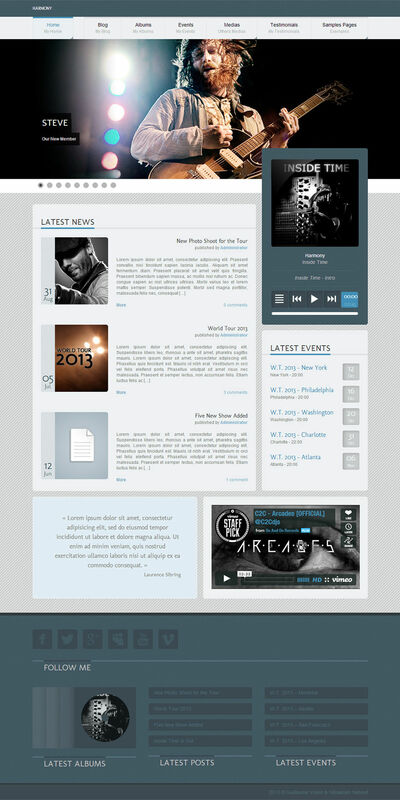 Harmony is a responsive HTML 5 theme for bands and artists aiming to promote their music and events. 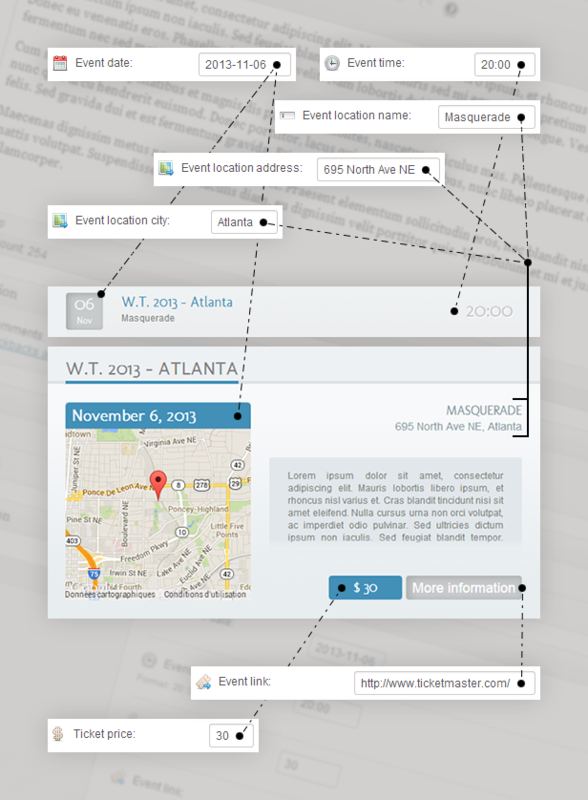 You can show your tour dates, blog and grab new fans thanks to social networks and testimonials. Share new albums, songs and videos and let your fans add their feeling in the comments. The theme is very easy to use for everyone. Simple modules and features are available so you can build a complete and custom website right away. 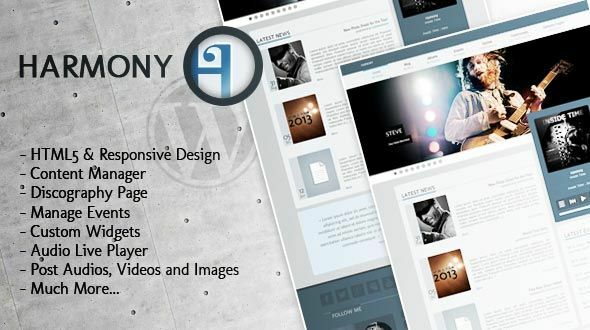 A content manager system lets you create all kinds of pages with lots of modules (twitter, slider, playlist and more). Add your latest albums and choose the songs available for listening. 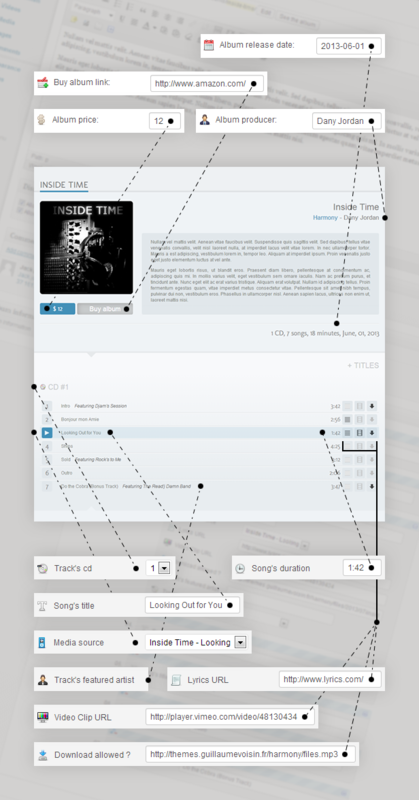 Songs will also be available in the playlist module that you can set anywhere in your pages. Let people know about your next events to come. When ? Where ? Ticket’s price ? Find information about events in the events page. Use custom templates to show photos and videos of your concerts and songs ! Use the built-in content management system to create infinite pages layouts and fill them in with lots of modules. Use the WordPress built-in Theme Customizer to setup the theme. Adjust colors, fonts, layouts and more ! Translation ready : use the .po files included to translate the theme in the desired language. Comes with English and French translations.